Gareth is the youngest brother of Sir Gawain and the son of Lot and Morgause of Orkney. He plays a significant role in Malory's Morte d'Arthur. Malory's "Tale of Sir Gareth" was apparently created by Malory. It presents Gareth as an exemplar of chivalry who is knighted by and devoted to Sir Lancelot and who acts chivalrously towards Lynette despite her abuse of him. This picture of Gareth, who avoids even his own brothers when they act less than chivalrously, is one of the elements that comes together in the final scenes of the Morte to produce the tragic ending. Lancelot blindly slays Gareth in his rescue of Guinevere from the stake. When Gawain hears of this, he turns against Lancelot and demands that Arthur pursue him to punish him, thus setting the stage for Mordred's takeover. 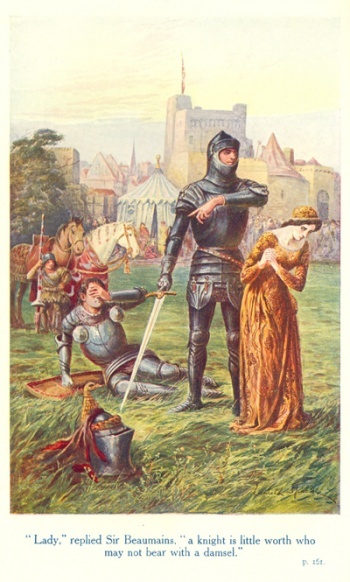 In Tennyson's Idyll of Gareth and Lynette, although Gareth, like almost everyone in Camelot, is not what he seems, he proves himself better than he seems to the sharp-tongued Lynette and the misjudging Sir Kay: he defeats a series of knightly opponents and rescues Lyonors.